Hi friends! Happy Friday! I hope you all had a great week and have a great weekend ahead of you! I'm hoping to just get some relaxing in this weekend. I'm kind of spent. Today, I'm sharing a project I made for a call that didn't get picked up. What can you do? I used Unity's I Ruff You stamp set for this lollipop holder. The patterned paper comes from Echo Park's Little Girl. I thought orange would be a fun and unconventional color for a Valentine treat. Of course, I used my own kids's names on this. ;) I kinda had too, they are just so darn cute! I finished this with a couple strands of Orange Divine Twine tied into a bow. Don't forget to check the Unity Blog to see everyone participating in today's hop! And LEAVE COMMENTS at every stop! You never know where that blog candy is hidden! Have a great weekend everyone! Oh my too cute!! love this!! oh my gosh - what a cute paper pierced doggie!!! love the hearts! This is just adorable! Love! Super cute! What a great project idea! The papers you choose were perfect! Cute idea! What a super cute idea, Ashley! Love it! The pink and orange are awesome together. What an ADORABLE idea!!! These are so cute!!! Great idea and what cute paper piecing of the hearts on the dog! oh this is just tooooo cute! Very cute, I just love seeing new ways to use stamps on craft projects, thanks for sharing! Cute cute cute! Love the paper piecing! LOOOOVE this! 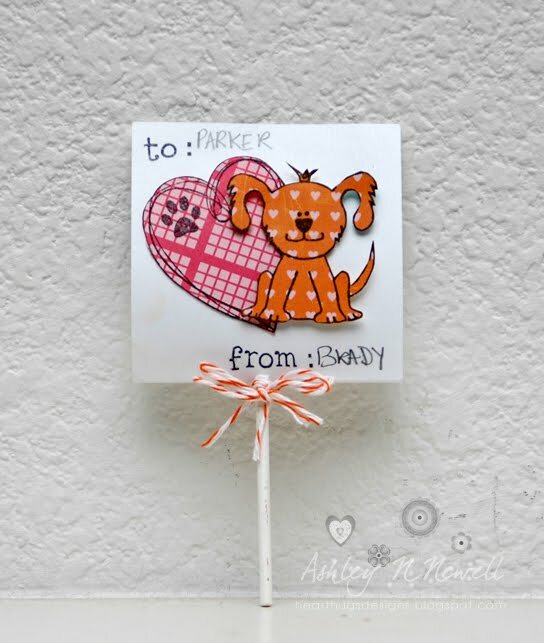 That pup is super cute--and my fav part, Brady gave this to Parkie:) LOVE LOVE LOVE! You should enter this in the twine challenge over at ATU!